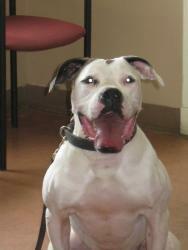 Taka, a 4 year old female American Bulldog was transferred to us from the Huronia Emergency Clinic one morning. She was taken to the emergency clinic earlier that morning when her owner came home from work to find her very lethargic, panting heavily and bleeding from the mouth. She presented to the emergency clinic non responsive, dark coloured mucous membranes, an elevated temperature and petechiae all over her body (bruising, indicative of a clotting disorder). Due to her appearance on presentation and physical examination findings she was diagnosed with Disseminated Intravascular Coagulation (DIC). Disseminated intravascular coagulation is an acquired syndrome where the animal starts to develop small clots throughout their body. The disorder can continue to a point where they use up their clotting factors and start spontaneously bleeding. The clotting portion of the disorder happens very quickly and rarely is the animal presented to a veterinarian during that phase. The first signs of the bleeding portion of the disorder are areas of bleeding under the skin (bruising). Unfortunately the disease has a poor prognosis and it can quickly progress to bleeding into body cavities causing difficulty breathing or can lead to organ failure and often death. DIC can occur secondarily to any disease that causes the body to be in a pro-coagulative (clotting) state. Examples of primary diseases are pancreatitis, liver failure, hyperthermia, cancer, dehydration and heartworm. It is hypothesized that Taka’s DIC was triggered by hyperthermia since she had an elevated temperature upon arrival at the emergency clinic. It was a hot, humid day and no underlying disease was found. Often it is difficult to definitively diagnose the predisposing cause of DIC. The mainstay behind DIC treatment is to treat and prevent further clotting and hemorrhage, if present, and treat inciting cause, if known. At the emergency clinic Taka was started on intravenous fluids, actively cooled and given 2 plasma transfusions. The plasma transfusions were to help replace clotting and anti-clotting factors. She was transferred to River Road Animal Hospital later on that morning. She was monitored and treated with supportive care over the next three days. Each day her condition and attitude improved. When she arrived on Wednesday morning she was quiet and lying on her side; too weak to stand. By Friday she was walking and greeting people with a tail wag. Taka returned one week later for a recheck. Her owner said she was back to her regular happy/crazy self and even took a moment out of her social schedule to pose for this picture. DIC is a disease that carries a poor prognosis but if caught early and treated quickly animals can pull through and make a full recovery just like Taka.